Claim 1: Palouse Prairie students develop the academic mindsets and habits of scholarship necessary to prepare them for success in and out of school. Palouse Prairie students develop the academic mindsets and habits of scholarship necessary to prepare them for success. At PPCS students explicitly learn and track habits of scholarship (HOS), which are needed to obtain a standard of excellence in real-world and academic endeavors. We know that the habits of mind and work that they develop in grades K-8 set them up for success in the future – in and out of school. Neurobiological research coupled with psychological studies have shown that factors, often referred to as noncognitive, or ‘soft’ skills play a role in helping kids develop strategies that might help them succeed. These skills include qualities such as perseverance (grit), conscientiousness, self-control, and optimism; they are not easily taught because they must be embodied to be effective. Children who exhibit these traits are more likely to experience improved outcomes, such as completing more years of education and experiencing better health in adulthood. These capacities also decrease the likelihood of kids (especially low-income children) experiencing single parenthood, having credit problems, or going to jail when they are adults (Paul Tough, Helping Children Succeed, 2016, p. 4). Our greatest measure of student success is the capacity to grow into productive and healthy adults. This line of research informed the development of our Habits of Scholarship (HOS), which were first established in 2014. PPCS identified the HOS traits of Responsibility, Grit, Craftsmanship, and Collaboration as the most important ‘soft’ skills that kids needed to be successful. PPCS developed a scope and sequence (PPCS HOS Scope and Sequence) of skills for each dimension across grades K-8 and spent the next year and a half working towards full implementation of HOS. In 2015 the school launched HOS to describe character traits, and since 2016 they have been embedded into instruction. Students routinely reflect on their use of HOS traits, which are explicitly assessed in achievement reports. Students intentionally build these skills through meeting high expectations, rigorous learning opportunities, and reflection. Students value these skills because they have first-hand experiences demonstrating how one or more of these traits can improve their learning or behavioral outcomes. In general, PPCS students demonstrate a high level of HOS proficiency. A review of achievement reports from the 2016-2017 school year shows that well over 80% of students are proficient or exemplary in HOS. 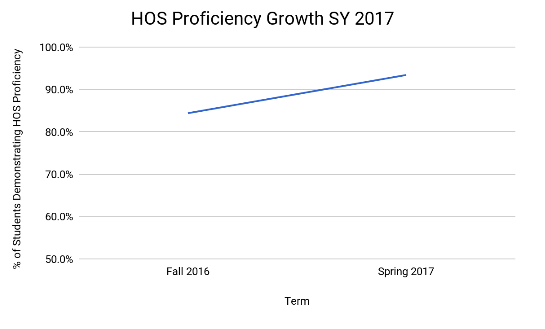 It is interesting to note that students are overwhelmingly proficient in HOS, and yet, they show growth from the beginning to end of the school year. This means that PPCS students are becoming more effective learners throughout the year. Students in SY17 demonstrated a 9% increase in proficiency of HOS from the fall to spring terms. By the end of the school year, 93% of PPCS students scored 3 or higher on HOS learning targets in their achievement reports, meaning that they routinely and successfully demonstrate responsibility, attend to the craftsmanship of their work, collaborate with their peers in meaningful ways and persevere through difficult tasks and see value in their mistakes. We know that Habits of Scholarship contribute to students’ mastery of content. 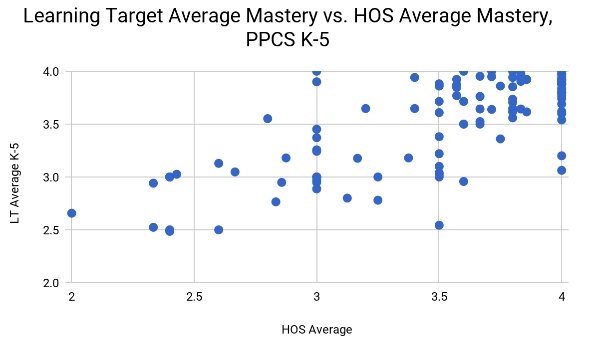 The graph below is a compilation of PPCS K-5 students that compares each student’s average HOS score to the average of their learning target scores in Spring 2017. The graph demonstrates that higher HOS scores correlate to higher learning target assessment scores. This correlation is evidence that students with strong habits of scholarship have better academic outcomes during their time at PPCS. Students who are better prepared and perform to high levels at PPCS are more likely to succeed in their future academic endeavors. I believe a school is where I can learn, work, interact with crew members and have fun. I believe a crew is where people work together to accomplish goals as a team. I believe learning is what everyone does to be able to accomplish things. I believe habits of scholarship are what people need to work on to be their best self. I believe I am the only person who knows what I can accomplish when I try. I believe my biggest struggle is picking responsible seats. I believe my biggest strength is learning. I believe I am ready for everything. As students prepare to leave PPCS in 8th grade, they demonstrate strong skills and academic mindsets to excel in high school and beyond. Students clearly articulate personal traits they have developed that are helpful to them. Students demonstrate a sophisticated ability to reflect on their Habits of Scholarship and articulate why they value those habits. Here are some examples of student reflections in 8th grade. During my time at Palouse Prairie, I’ve learned a lot academically, but my biggest achievement has been how I’ve grown mentally. Since first grade I have learned about and demonstrated the CREW traits; courage, responsibility, empathy, and welcoming. I have also been taught about the habits of scholarship; craftsmanship, responsibility, collaboration, grit. These traits have helped strengthen me mentally, and have prepared me for many challenges I will have to face both in high school and in the rest of my life. An example of this is empathy. Empathy has resulted in me being more compassionate and helped me understand that I can’t have the same expectations for everyone. In third or fourth grade, I couldn’t really handle being in a group project. I would get quickly frustrated at the other people in my group for not immediately understanding things exactly the way I did. In 7th grade, empathy finally clicked for me. After that, when working with groups, I understood that everyone had different thinking than I do, and that it was no reason to get upset. Having diverse thinking and opinions increased the quality of our work. This will help me in high school by making me a better team member and allowing me to better get along with others. PPCS’s decision to embed Habits of Scholarship into our curriculum in 2014 has supported our students in developing the mindsets and habits necessary to be successful beyond school. Student voices like Acer’s, Molly’s and Caleb’s demonstrate that PPCS students develop academic mindsets and habits of scholarship to succeed in this world – both academically and personally. They are prepared to take on academic and professional challenges and ready to excel. Our data show that all of our students show growth in their Habits of Scholarship over time, and that proficiency in Habits of Scholarship correlates with academic success. Research has shown that developing these types of character traits correspond with healthier and more productive adult lives.